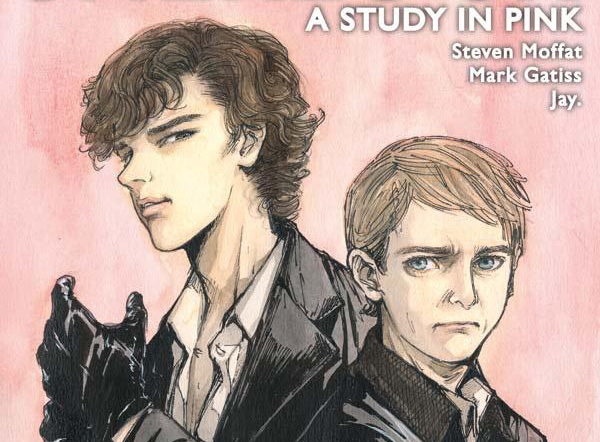 SHERLOCK: A STUDY IN PINK #4 Review @comicstitan | Warped Factor - Words in the Key of Geek. There’s an unconscious attempt early in issue #4 to mirror this effect, because this is the issue that includes Sherlock and John’s awkward, and almost entirely theoretical meal, while staking out the address where the killer will need to collect his victim’s suitcase. That conversation essentially goes over the ground of ‘normality’ and ‘Sherlock-world’ again, this time with the man himself giving his brusque judgments on such things as ‘real life.’ But this is not, by its very nature as a black and white, almost entirely faithful reproduction of the episode, a comic-book that deals especially well with fairly static dialogue sequences. It deals far better with moody shadows, as in issue #3 where John meets the man we’ll come to know as Mycroft, and it deals excellently well with action sequences, Jay, the artist, bringing a new perspective to delivering some already striking TV visuals in a manga style. Fortunately then, after a fair chunk of this issue taken up with the two-and-fro banter of the stake-out and John’s increasingly strident insistence that he’s not Sherlock’s date, this is also the issue that includes one of the stand-out sequences in the episode, the chase sequence that not only involves a lot of action and running, but also allows us a glimpse of Sherlock’s mental processes in action at speed. Jay renders that sequence with a certain faithfulness to the original, while taking enlightened creative licence with it so that it delivers its pace in a way that’s comic-book accessible, and that pushes the story along in that format. Lots of long, narrow panels allow for the figure of Benedict Cumberbatch to look fast as he leads the chase, and a version of his mental map of ‘the battlefield’ without the benefit of on-screen neon, while challenging, adds back that sense of digital clarity to the way Sherlock sees the world and thinks about it. In previous issues, a peculiarity that’s added value to the comic-book instalments of A Study In Pink has been the in-panel Japanese lettering that remains, and the inter-panel use of ‘stage direction’ – step, step, smirk etc to underline and overwrite any shortcomings in the actual drawings of the characters and action. In issue #4 though, it’s fair to say this develops into substantive overkill – it seems unlikely that the direction ‘Step, step, step, step’ is necessary alongside an image of a spiral staircase, and actually feeling obliged to read such descriptions slows the pace of the sequences here when they’d be more effective left fast. 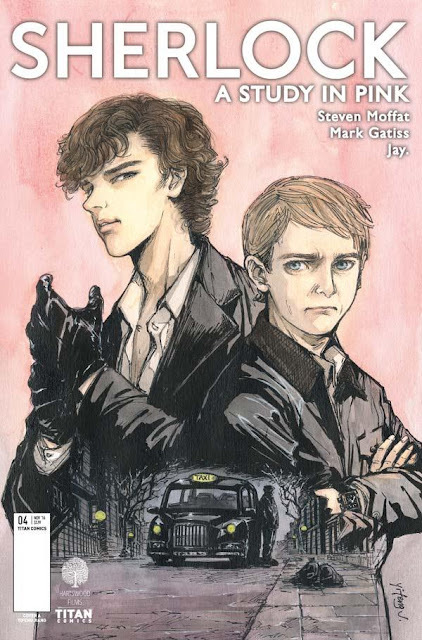 That said, there is an element of particular artistic interest in this issue – Just as in issue #3, the use of black and white artwork became symbolic of Sherlock’s view of the world, so in issue #4, while most scenes are set to gently hatched or hazed backgrounds, there’s one item, one element that’s absolutely solid whenever it appears, and stands out because of that confident presence. The London taxi cab. The cabbie’s vehicle here is the most fundamentally ‘real’ element in the issue, giving it a ready symbolism as the item of most unswerving certainty in a world of hazes, in which only Sherlock seems to see things clearly. Even he has yet to work out the answers to the questions he cogently asks – who hunts in a crowd? Who do we trust immediately, even though we don’t know them? But the artwork is already advising us than in this world of questions, one thing is certain – you can always get a cab. Bottom line, it will probably always be a little difficult for Sherlock fans who’ve seen the show in English to entirely see the point of the manga version in their market unless they’re particular fans of both the show and the form (and let’s be honest, we’re geeks, so that’s not exactly a million-to-one chance). But even if you don’t fall into that bracket, there are interesting things in issue #4, most notably the street chase, to warrant paying your money and taking your chances. Are there too many interruptive scene directions? Yes, in this issue a quirky added-value element is taken beyond the point of usefulness and into the realms of irritation. But still, this is a take on A Study In Pink which, while utterly faithful in terms of most of the script, manages to add some visual flair and some touches of comic-book meaning that aren’t present in the TV version by virtue of the non-viability of delivering such contrasts between haze and clarity.